Get a better energy boost than a cup of coffee with this powerful green kiwi smoothie loaded with vitamins, minerals and superfood antioxidants! With a wonderful rich flavor, this superfood shake can be a meal replacement. This smoothie is an excellent source of calcium, iron, protein and vitamins A and C.
Definitely the best way to start your day is to charge your batteries with Vitamin C detox bomb. It will cleanse your liver and help you get rid of all the toxins accumulated over time. Packed with more vitamin C than an equivalent amount of orange, the bright green flesh of the kiwi fruit speckled with tiny black seeds adds a dramatic tropical flair to any smoothie recipe. Kiwi is a superfood and besides vitamin C, it is also packed with vitamins A and E which help prevent free radicals as well as certain types of cancer. Kiwis also helps flush out toxins from the colon, which improves your overall health and well being. Parsley is another ingredient of this delicious drink that can help you with your overall health and fitness goals. If you have parsley growing in your herb garden you’ve got more than just an attractive garnish and a tasty herb. You also have a key ingredient for burning fat and maintaining a healthy weight. Science confirms that parsley can do a real magic when it comes to flushing out toxins and fat. It provides powerful antioxidants, acts as a diuretic and can help balance the hormones that contribute to weight gain. Parsley has diuretic properties and aids digestion, both of which can help jump-start a diet. Parsley leaves are rich in flavonoids and antioxidants and are packed with essential nutrients such as magnesium, calcium and potassium. Why we Should Blend the Greens? 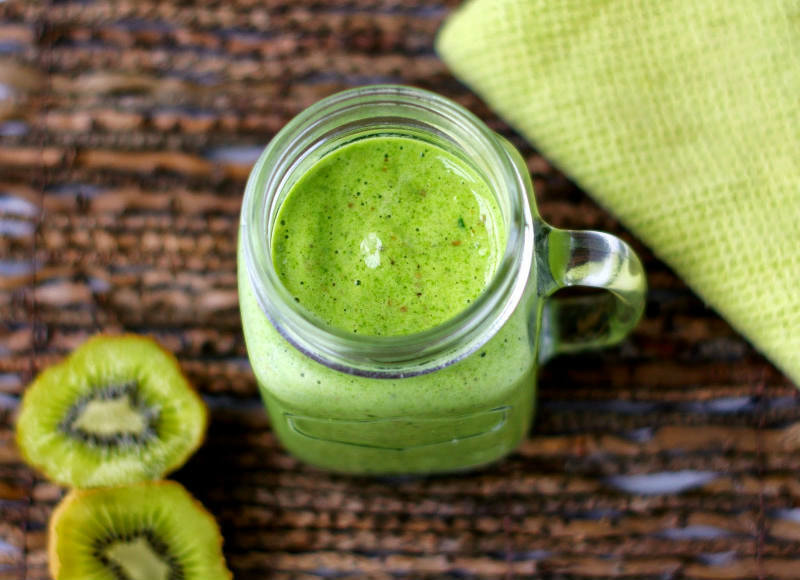 This kiwi smoothie will help you to clean your organism from all the toxins. Blend all the ingredients well and consume the cocktail right after preparation. Optionally, you can add half a mango or a handful of young spinach leaves or a few broccoli. Enjoy in this incredible kiwi smoothie!